iTools is a simple and powerful tool for iPad, iPhone, iPod touch users. It is 100% free ware and green, even do not need to install onto your PC, it has no ads or plugins in it. 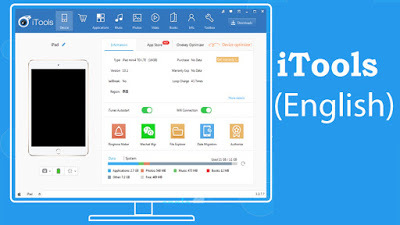 iTools is powerful, can easily manage media, iBooks, pictures and other files in your iDevices; it can help install, uninstall and backup your apps; it also can backup and restore your folders. iTools can help you manage your files in iDevices like windows. Supports devices: iPhone 1,3G,3GS,4,4S iPad 1,2 iPod touch 1,2,3,4. Supports iOS versions: iOS 1, 2, 3, 4, 5. Works with both Jailbreak & unJailbreak devices. Applications management.Supports install, uninstall, backup, update. Supports Music, Video, Ringtone, Podcast, iTunes U, TV Shows Audio books, Music Video & Voice memos. Imports & exports media files from computer to devices. Transforms mp3 into m4r when drop mp3 files into Ringtone. Transfer from video files into mp4 when drop into Video. Search lyrics & covers from internet. (iOS 5 not support yet). Plays mp3 files on the device. iBooks Supports: Imports and exports PDFs/Epubs. Photos and Albums management : Imports and exports. Manages docking & desktop by mouse. a. Smart classify supports automatic classify icons into folders named by system category. b. Docking & desktop Folders and positions backup and restore. Imports & exports into csv/outlook.